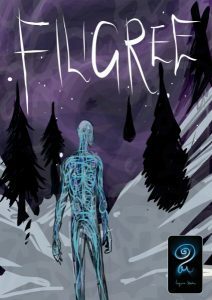 Our first speakers were Will Starling and Adam Willis, the creative entrepreneurs behind the recently published Filigree comic and fledgling Magoria studios, a newly formed but potentially exquisite beast hoping to plug a gap in the UK’s indie publishing market. They have an ingrained rapport that translated into an amusing presentation, provided interesting feedback on the decision making process they followed when establishing their imprint and the choices a young business of this kind has to make, such as relate to printing and branding. 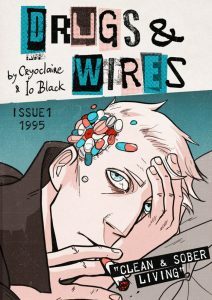 Next, word from the wonderfully frank Cryoclare about her anarchic Gibson-tinged retro-tech web comic, Drugs and Wires, recommended for fans of downbeat science fiction and 90’s design aesthetic. Her presentation posed the question, ”Is making a web comic a good idea?” My personal response was “definitely not” as the level of technical acumen required is certainly considerable, but many of the group clearly took inspiration from Cryoclare’s practical knowledge of Mastodon, Gravilix, Patreon and other techy things. Her passion for the medium was obvious and matched by her deep level of knowledge, it is clear there is much to learn here.